American Deluxe Jazz Bass V [2003-2009], 5+ string bass guitar from Fender in the American Deluxe Jazz Bass series. Product replaced by the Fender American Elite Jazz Bass V.
MGR/Max's review"Fender American Jazz Deluxe Bass"
I bought this bass at RIT, because its a classic great sounding bass. The string through design, gives it some awesome substain. Large body and neck, makes playing faster harder, but makes it sound better. American made quality, sounds and feels solid. Fender built this bass very well. 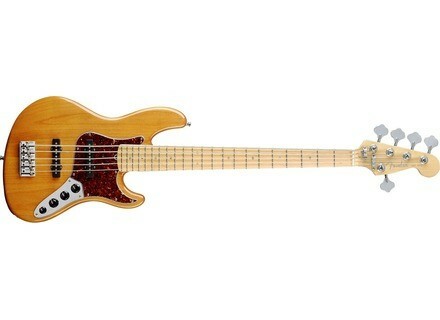 Completely manufactured in the United States we are well attended by the classic Jazz Bass Active. standart bridge, pickups noiseless preamplifier 18 Volt. Bass and treble settings mediums volume + balance neck / bridge. the handle to the key 22 in Rosewood immediately gives a vintage feel. most: comes with cleaning kit / tuning and belt with "straplocks." The factory is a little too "vintage" string spacing (it is a "4 +1"), action too high. 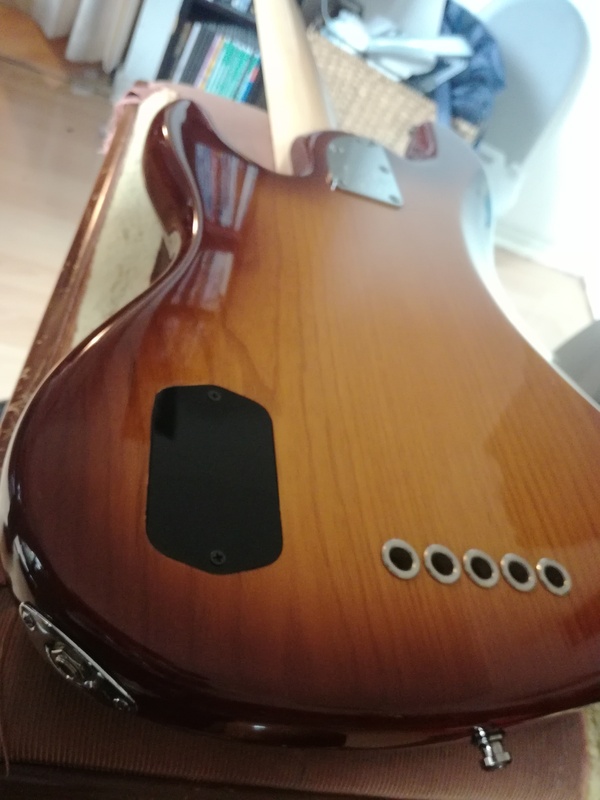 after a quick adjustment found comfort and low down on the action without too much problem, but the purchase of a replacement bridge seems to me to consider for those who like to groove without killing your fingers! access to the treble is good but it is anyway not a criterion detrminant when buying this kind of low. The weight / balance is perfect, the dress is very "close to the body" and your back will thank you! First test via a DI in a Mackie Hu8 through a MOTU interface: the sound kills outright! The preamp does its job perfectly, all settings are exploitable and is navigated with the happiness of his "Pasto" in this medium and its carved and dynamic slap "on Marcus." the grain is everywhere and gives this bass its character (and who made an instrument of legend). With a second assai Mindprint DI as a: the grain becomes énôôrme (too?) And we say it twice preamplifier innutile of the microphones on stage ... the third test (finally!) Technicians his will thank you to send such a signal in console: the signal is clean and free of parasites, even by releasing the ropes (thank you noiseless!) If the serious down happily in the subs, the grain is there despite the Equal right of the console back, the dynamic is enormous and I quickly forget the absebce amp ..... too easy: it's happiness! 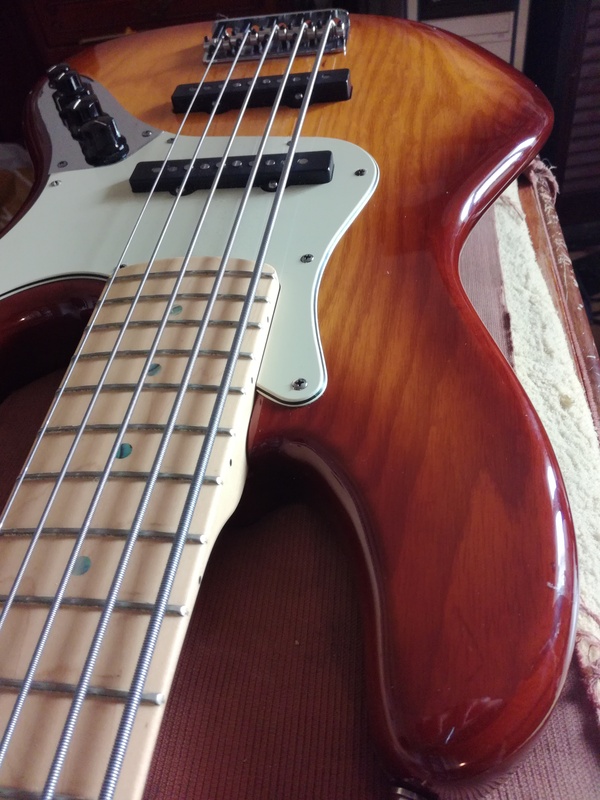 This low, thanks to its preamp effective, is comfortable in all styles, sometimes through setting (see above), but his versatility does not sacrifice his personality: it is not for nothing that almost all bassists Jazzbass are not very far in their equipment. in studioje still uses "ID", more rarely through a preamp, same thing on stage in a club and EBS 4 * 10 with a faithful response perfectly suited to the electronics of the instrument affirmed. The sound is round and granular at a time (two microphones) can be soft as desired (neck microphone), or singing "how to pastoral" with micro acute. his palette is so extensive that it is difficult to describe all the possibilities of active Jazzbass. She follows me for three months and has become my main instrument, having had a Kopo, a 5 string Peavy, a vintage Jazzbass 62 (aaargh. .. what a shame it was a loan !!!! ), a musicman 5 strings (rock too! ): it has so far not been in default. only regret (apart from the small detail of the attachment strap): a factory setting, but too difficult to play the violin can easily be the setting of "house" through a little know how. I suggest you a passage from your favorite maker a few months after purchase. I would do not only this choice but I can also say that I will never go away too far from a Jazzbass, on stage and in studio, I promise! American Deluxe V. 2 JB pickups noiseless. Channel 22 boxes. Bass, shape, EQ + trebble overall volume. Deluxe tuning machines: plastic! light, but you do with time. Bridge classic "thru body": very adjustable (height, distance between the strings) happiness. Not too heavy. 9 because of the plastic. Top for my taste - even the factory settings. I'll see later for the spacing between the strings - can be a bit tight for the slap, I have not yet understood. Standing or sitting: it seems that the thing is part of your body very good ergonomics. I find that I am crossing faster and more complex than on my Ibanez 4 string with a handle end and very fast. This tool changes the musical approach: for example, attacks. The pickguard ... I would be happy not to have it at all, but hey you get used to it. 9 for the pickguard. Top. On the amp or direct recording. It takes some getting used to the SI (after 4 strings is particular). Its full potential, while remaining in power, roundness and grain. Nothing to say - Fender Jazz Bass. I've had three weeks. 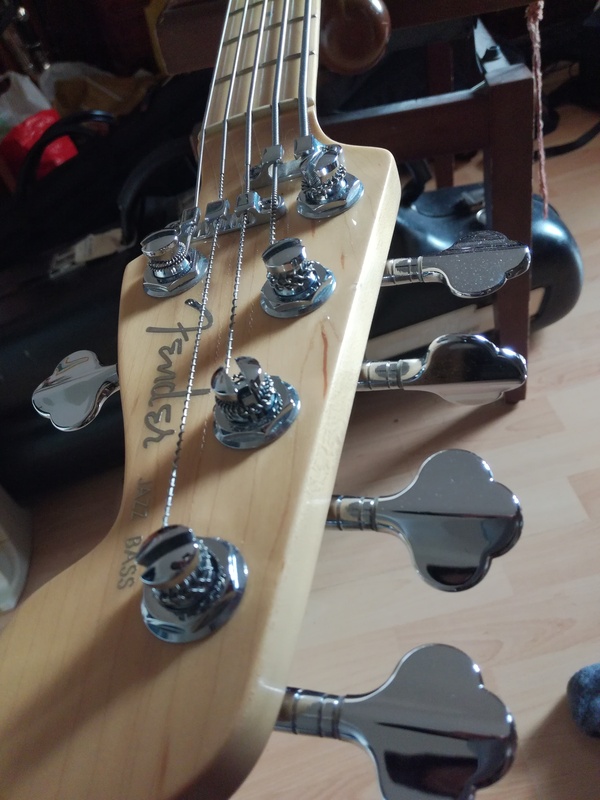 I chose it after much testing of different manufacturers: I hesitated at the end between her and StingRay V (excellent tool) - I chose the jazz bass. What I like least - is the price, but it is, never mind. I do not regret my choice (I love this instrument) - for those who love the Fender Jazz Bass, I highly recommend it. 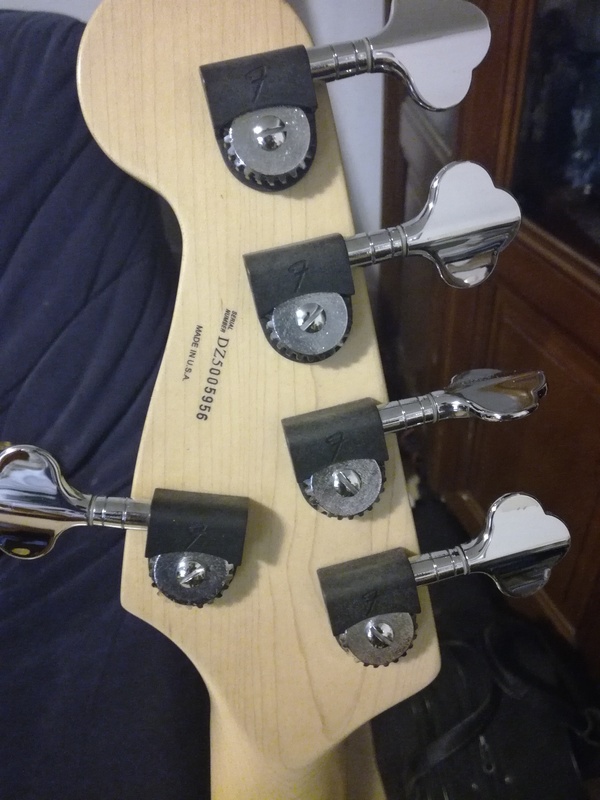 Nimes bought used 1100, good state, I had to settle the handle for my type of game, I like the look solid but the bridge is in sheet metal, damn the man that is more Fender I possd a jazz bass mexico, Barillon a 6-string, an Ibanez ATK 300, a cort funk machine 2 (very good report quality price), but I found it is on the my sound, suggestive trs ide!